S Club 7 star Paul Cattermole will be doing the Time Warp again on stage in The Rocky Horror Show but doesn’t think he will Bring It All Back with the band any time soon. The band, who starred in TV show Miami 7, had a reunion tour last year but he doesn’t seem keen to repeat that. Paul said: “I’m not really sure if it’s the kind of thing that’s going to work any more. “It has made a lot of people very happy and some of it made me happy but that’s way back in the past. He joined the band out of drama school and wasn’t asked to sing or dance at his audition, although he could. He said: “The alarm bells were ringing in my head and I should have listened to that. Paul said he had a great time in Miami filming the show, as well as hair-raising moments filming with an alligator. Paul had only seen the Rocky Horror movie before he auditioned for the dual roles of bad boy Eddie and his scientist uncle Dr Scott. He said: “When I saw the show live, it was awesome. It’s one of the best shows I’ve ever seen for script, comedy, music and characters. He’s had great fun putting on the fishnets as Dr Scott. The show is famed for audience interaction. Fans dress up and have set responses to lines. 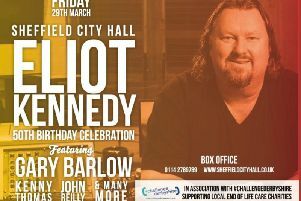 He remembers working in Sheffield with music producer Eliot Kennedy.